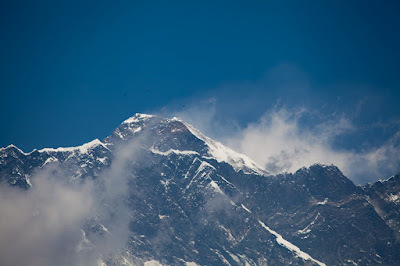 The world’s highest mountain, Everest, also known as Sagarmatha or Qomolangma (‘Holy Mother’), is the ultimate bucket-list item for super egos. Last week over two hundred climbers tried for the summit during good weather. Holy Mother was more defiled than usual by the tragedy unfolding on her flanks on the last stretch below the summit at 8000+m altitude. The Death Zone lived up to its reputation, with four climbers dying there in the same 36 hour period. The Australian report makes chilling (no pun intended) reading. The final climb route is narrow with room for only one fixed rope, so climbers have to literally climb over each other if someone stops, dead or otherwise. Britisher Leanna Shuttleworth, 19 years old, and her father Mark did just that. The first body they met was Shriya Shah-Klorfine, a Nepalese-Canadian woman who had died the previous day. They unclipped themselves off the rope to go past her, and then clipped back on to continue. Shuttleworth reports on their next encounter: “There was another man who was almost dead; he was sitting attached to an anchor…and I just thought it was a dead body rocking in the wind, but as we passed he raised his arm and looked at us. He didn’t know anyone was there. He was almost dead. He was dead when we came back down”. Just think for a moment about what she is actually saying. They literally left him for dead. That body was either Wang Yifa, a Chinese climber, or South Korean Song Won-bin, both of whom died in that period. Next was the dead body of Eberhard Schaaf, a German doctor. Shuttleworth’s team cut him from the rope to get past. Leanna was ‘briefly elated’ when she reached the peak but believes the day will haunt her for life: “You’re thinking, ‘Is there anything I could have done?’ It’s put me off Everest. I really, really didn’t enjoy summit day because of that”. What a shame her fun was spoilt. The answer to her question: yes, her team should’ve tried to help Yifa or Won-bin. How did she know that the semi-conscious climber was unseeing or almost dead? The callous and matter-of-fact rationalisations are very cold indeed. What happened to common decency and empathy? Shuttleworth deserves to be haunted. She still lacks remorse and insight. The story has a redeeming strand of mountaineering ethics. Israeli Nadav Ben Yehuda, 24 yrs old, came across Turkish-American climber Aydin Irmak, who he’d befriended at base camp, slumped only 250m from the summit. Yehuda gave up his ascent, carried him back down and Irmak survived. Yehuda also found a semi-conscious Malaysian climber on the way down, when another climbing team appeared: “After a long debate they gave him oxygen and he survived”. Debate about what, one wonders? And, where were the abandoned climbers’ mates? The selfish indifference of all these ambitious goal-seekers determined to claim their moment of glory and bragging rights is staggering. Is this the inevitable result of our corporate-cultured and self-centred societies, that we can climb over dead bodies, or walk past those still alive, merely in pursuit of our own fame?